The Introduction - What is Holistic SEO? Holistic SEO is a term used to describe development in which content, marketing, technical best practices, performance, security, user experience and user intent come together to create an ideal URL on the internet, about a certain topic. Why should we advocate taking a Holistic approach to SEO? As search engine algorithms get more complex and intelligent, we won't be able to control or predict changes, and more importantly, it defines a set of best practices that we can develop upon which helps the content creators ultimately benefit the user. Answers questions the searcher has asked. Is deeply informational about a topic. Helps the user complete a transaction. Before we get into the ranking factors, Lets start out showing the various ways this page is ranking. 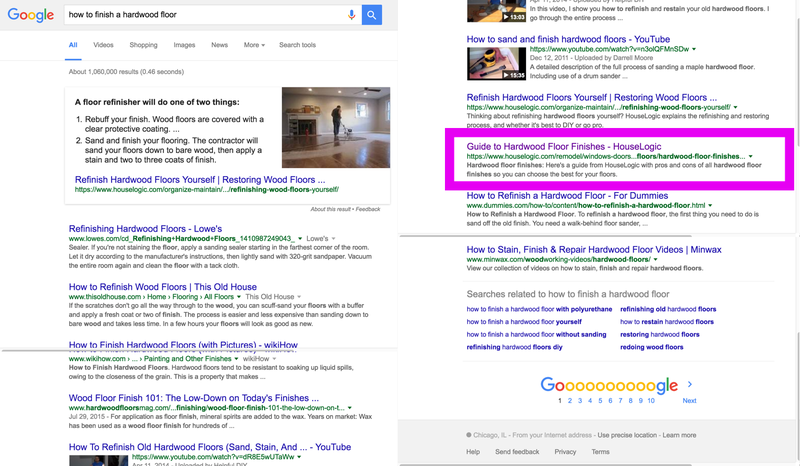 I first noticed it by searching with the search term "hardwood floor finishes". Our page is the 1st result on a primarily Informational search, that has a small Transaction element, the shopping box in the sidebar. 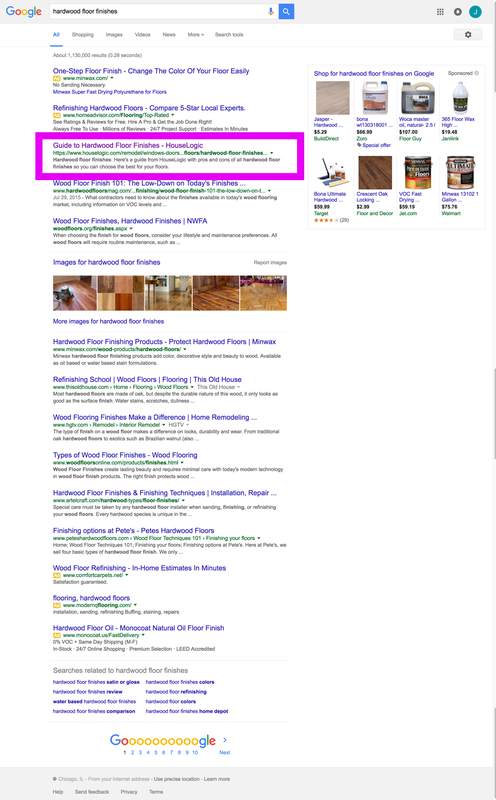 We have similar results for "wood floor finish", but Google considers the transactional element a little bit more, and moves the shopping box front and center. 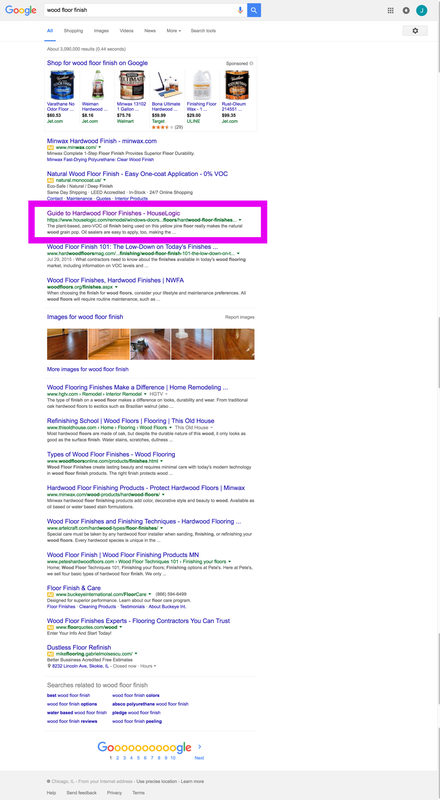 Where it gets interesting is when we search "how to finish a hardwood floor". Our page is returned 8th. Knowledge box and videos all are "How to"
Our page is a product guide, not a How to, but Google believes the information is valuable knowledge, and of interest to the searcher. The last term I searched for is "wood floor finishing" in which our page is returned 3rd. This search is clearly considered a transactional search as we get the Google Maps/Business listing showing local floor finishing companies. We are also presented with Yelp business reviews, Home advisor business listings and local Contractor websites. The page in question does not fit in with any of these transactions, about finishing my floors, or hiring someone to finish my floors, but is still listed because it is considered good information for the topic. In another example, I search for "little bub fireplace". The words "little" nor "fireplace" exist on the page, yet I get the result. Google knows the piece of content I need, even if I get 2 of the 3 words wrong! Topic based - returning good content that is related, but not specific to the search term. Excited yet? I am. 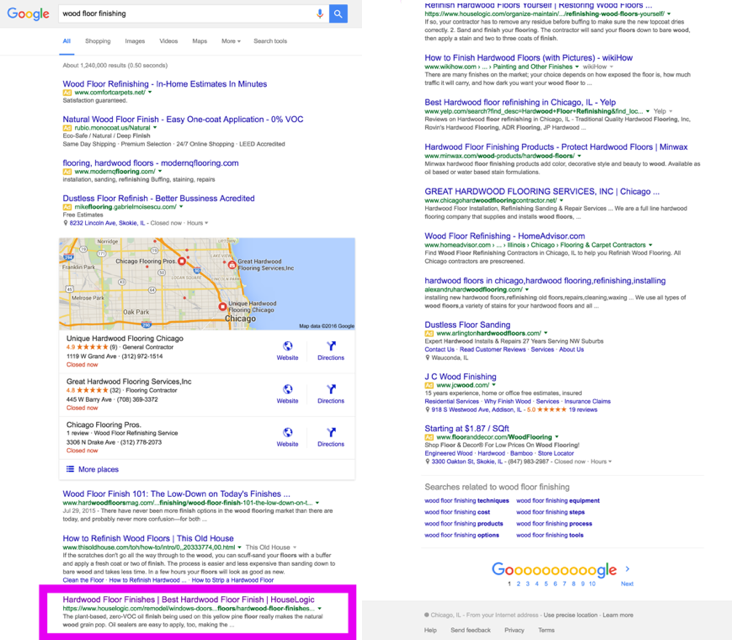 Let's dig in and talk about the scale of the current state of search. On May 24th, 2016 Google revealed to Search Engine Land that users make at least 2 trillion and less than a quadrillion searches each year. Rand Fishkin of Moz tweeted shortly after deduced that is was closer to 8 billion searches a day, which would put it closer to 3 trillion searches per year. Over half of those searches happen on smartphones. What can we deduce from this information? That there are at least 1 trillion mobile searches, that in 1/3 of those searches the user's location is a ranking factor, and that the user's location is a ranking factor that is growing faster than any other type of search. Thanks Google, duly noted! This is a big topic, and I have decided to break this post into three parts to make it more digestable. In Part 2, I will review the most common search engine ranking factors, and how to keep up to date and an overview of content strategy and how it can guide development. In Part 3 I will get down to business and discuss technical SEO best practices for Drupal, and provide a list of tools developers can use as they implement a holistic SEO approach for their clients.